Asked at an energy forum in Moscow to comment on the Salisbury case and its consequences, the Russian President launched into a tirade against Skripal, who was hospitalized along with his daughter Yulia after exposure to a military-grade nerve agent in the English cathedral city. "I see that some of your colleagues are pushing the theory that Mr. Skripal is almost a human-rights activist," Putin said. "He's just a spy. A traitor to the Motherland. There's such a thing as a traitor to the Motherland. He's one of them. He's just a scumbag, that's all. "Putin said that the Salisbury affair "is being artificially … blown up" by the media, but added: "It'll pass, eventually … The sooner it's over, the better." The comments come amid a deepening diplomatic clash between Moscow and the UK, which has blamed the March 4 poisonings on the GRU, Russia's military intelligence agency.UK investigators have also formally linked the attack on the Skripals to the June 30 poisoning of Dawn Sturgess and Charlie Rowley, a couple living in Amesbury, near Salisbury. Sturgess died on July 8 after applying a substance to her wrists from a perfume bottle found by Rowley.The Kremlin has consistently dismissed official British allegations.Sergei Skripal was convicted in Russia of spying for Britain before he was granted refuge in the UK after a high-profile spy swap in 2010 between the United States and Russia. "Espionage, like prostitution, is one of the most important professions in the world," Putin said, alluding to a Russian saying. In further remarks, Putin called the Amesbury case "crap," and derided the victims as homeless people, state news agencies reported. "Some dudes showed up and started poisoning some bums in the UK," Putin said, according to state news agency RIA Novosti. "What kind of crap is this?" 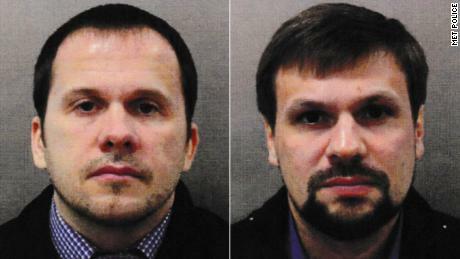 In early September, British authorities released the names "Ruslan Boshirov" and "Alexander Petrov" as the suspects in poisonings. Prime Minister Theresa May and British authorities believe the men were traveling under aliases.Following the release of the names, Putin described the two suspects as "civilians." He said Russia had identified the pair and found no evidence of criminal activities. 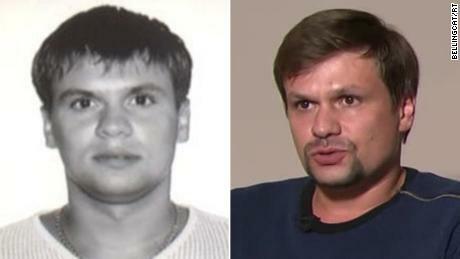 The accused men, identified as "Petrov" and "Boshirov," told the Kremlin-backed RT network that they were businessmen in the fitness industry, selling supplements and advising on nutrition.They denied poisoning Skripal, saying the purpose of their three-day trip to the "wonderful town" of Salisbury was to visit its cathedral, with its 123-meter spire and famous clock, the "first of its kind anywhere in the world." But more than a week later the UK investigative website Bellingcat claimed to have identified "Boshirov" as GRU Col. Anatoliy Vladimirovich Chepiga — whose name was found on a list of people receiving the Hero of the Russian Federation award in December 2014. Russian Foreign Ministry spokeswoman Maria Zakharova described the report as "bogus" in a Facebook post and part of an "information campaign, the main task of which is to divert attention from the main question: WHAT HAPPENED IN SALISBURY? "Zakharova repeated her assertion that "there is no proof" that Russia was involved in the attack. CNN's Nathan Hodge and Emma Burrows reported from Moscow and Tara John wrote in London. Billy Bob Thornton isnt here for political chat (Picture: Getty) Billy Bob Thornton isnt throwing hi..